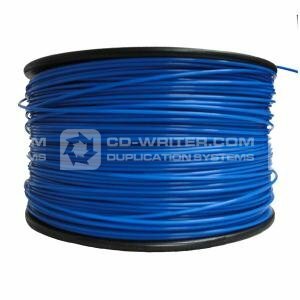 A 1Kg (2.2lb) coil of Blue PLA 1.75mm filament wound around a sturdy plastic spool. This is Natureworks PLA4043D extruded into 1.75mm filament. This is a wonderful build material. It has minimal warp when cooling. The pigments used in our color PLA are all bio-friendly and designed for use with PLA. PLA . 1.75mm . Blue . 1Kg . on . Spool .